18K yelllow gold case 7 moving diamonds and 5 sapphire cabachons, diamond bezel, white dial, quartz movement, 18K yellow gold bracelet. Water resistant to 30 meters. 18K yelllow gold case 5 moving diamonds and 5 sapphire cabachons, white dial, quartz movement, leather strap. Water resistant to 30 meters. 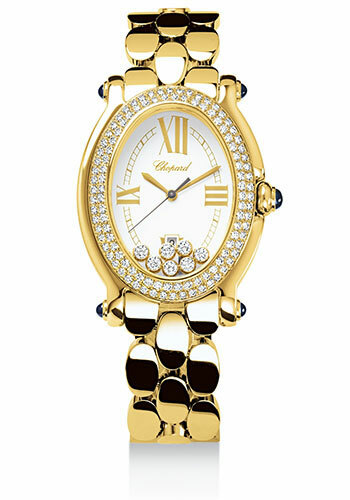 18K yelllow gold case 5 moving diamonds and 5 sapphire cabachons, white dial, quartz movement, 18K yellow gold bracelet. Water resistant to 30 meters.